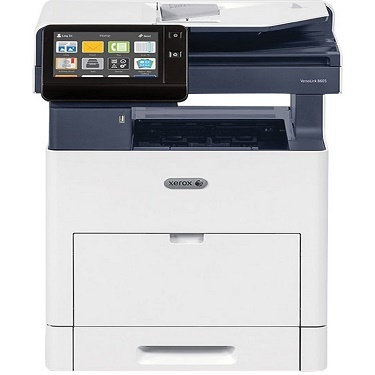 The Xerox VersaLink B605/S B/W Multifunction Printer is a multipurpose printing device capable of printing, scanning, and copying the documents. The Xerox VersaLink B605 has a maximum mono print speed of 58 pages/ minute, allowing you to undertake large print orders easily and quickly. Its maximum print resolution stands at 1200x1200 dpi, giving you sharp and crisp printouts. The big and bright 7-inch touchscreen lets the user view the icons with ease. The B605 B/W Multifunction Printer is a comprehensive device equipped with a host of features such as color scanning and monochrome copying. Both the scanner as well as the copier of the VersaLink B605 B/W Printer are flatbed. Bring home the Xerox VersaLink B605 B/W Multifunction Printer to take your everyday printing productivity to the next level. Dimension (Height x Width x Depth) 25.3" x 18.5" x 19.8"